The opening chapter provides a useful potted history of MI5 up to the end of the Cold War. The picture of the service that emerges is of a hidebound bureaucracy, little changed from the Spycatcher era, obseesed with supposed left-wing subversion and struggling to cope with the demise of its familiar targets. Stella Rimington, Director-General from 1992, found a new role by wresting responsibility for countering IRA activity in Britain from the Metropolitan Police. Shayler, who worked in this area from 1992 to 1994, was one of a number of officers recruited as a result of Rimington's attempts to bring new blood into the service. He regarded MI5 as more successful than the Met against the IRA but nevertheless felt that execessive bureaucracy had allowed bombings that might have been prevented. If Rimington is presented as a moderniser, her successors Stephen Lander and Eliza Manningham-Buller come across as the old guard. Between them, they outmanouevred Rimington to block her deputy, Julian Hansen from reaching the top job. In 1994, Shayler moved on to G Branch covering Middle Eastern terrorism. He would later reveal that MI5 had received prior intelligence of the bombing of the Israeli Embassy in London that year, but failed to pass on the warning. By 1995, he was on the Libyan Desk which brought him into regular contact with MI6.From his opposite number he learned that MI6 sponsored a plot by the Militant Islamic Group to assassinate Colonel Gadaffi, a story that was later confirmed by Mark Urban. likened the difference in ethos between the two organisations to that between a grammar school (MI5) and a public school (MI6). He regarded MI6 as too enamoured of its own James Bond image. It was his frustrations in this position that eventually led Shayler to go public. Ironically perhaps, the immediate cause was the refusal of MI5 lawyers to grant him a warrant to intercept Libyan communications. Shayler's story appeared in the Mail on Sunday in August 1997. He fled to the continent with his partner Annie Machon, also a former MI5 officer, but did not escape the official backlash. He spent four months in a Paris jail before the French courts ruled against his extradition. He ultimately returned to England where he served a short prison sentence for breaches of the official secrets act. Shayler's story is very much an example of the Robin Ramsay's dictum that the British secret state would have far fewer whistleblowers if it was a better employer. Many of his criticisms concerned fairly arcane management issues. Others however, raised political and moral issues of much wider public interest. 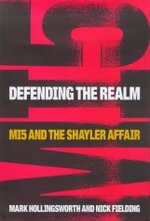 Hollingsworth and Fielding effectively combine Shayler's story with other evidence to produce a valuable overview of the methods and structure of MI5 in the 1990s. It should, however, be noted that a draft of the manuscript was submited to the D-Notice Committee, a decision which the authors defend as 'legal prudence that should not be construed as approval of a 'repressive and undemocratic' system. In their final chapter Who Watches the Watchers, they raise fundamental questions about MI5's accountability and its value as a separate institution. The War on Terror may have allowed MI5 to evade those issues in the years since, but if anything, it has only made them more urgent.